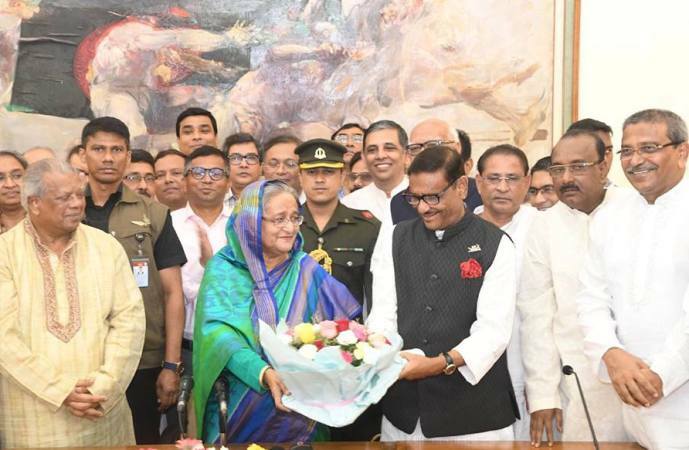 Prime Minister Sheikh Hasina returned home on Monday morning from New York via London after wrapping up her a week-long official visit to the United States. A VVIP flight of Biman Bangladesh Airlines carrying the prime minister and her entourage members landed at Hazrat Shahjalal International Airport in Dhaka at 9.20 am. The premier left home for New York on September 21 to attend the 73rd Session of the United Nations (UN) General Assembly. Sheikh Hasina addressed the 73rd Session of the UN General Assembly (UNGA) at the UN Headquarters in New York on September 27 and had a meeting with UN Secretary General Antonio Guterres. On the sidelines of the UNGA, the prime minister held bilateral meetings with Dutch Queen Maxima, Estonian President Kersti Kaljulaid and US Secretary of State Mike Pompeo. The premier attended a Welcome Reception hosted by US President Donald J. Trump. Sheikh Hasina also joined a number of high-level events on Rohingya crisis, cyber security, peacekeeping, women empowerment, girl education and global drug problem. She too joined a luncheon and roundtable meeting arranged by the US Chamber of Commerce. During the UNGA, the prime minister received the ‘International Achievement Award’ from the Inter Press Service News Agency for her exemplary humanitarian response to more than one million displaced Rohingyas of Myanmar by giving them shelter. Global Hope Coalition’s Board of Directors also adorned her with ‘2018 Special Recognition for Outstanding Leadership Award’ for her farsighted leadership to deal with the Rohingya crisis. Sheikh Hasina attended a civic reception accorded to her by expatriates Bangladeshis living in the USA.